The top four reasons I wish I spoke Spanish. 1) The poems of Pablo Neruda. 2) Patty Griffins rendition of "Mil Besos"
3) A girl named Maria who worked one cannery summer with me. I could fall forever in her eyes. 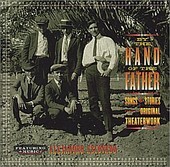 4) The Alejandro Escovedo album By the Hand of the Father. Though this collaboration of Escovedo and playwrights Theresa Chavez, Eric Gutierrez, and Rose Portillo is not entrenched in Spanish, a first hand understanding of the language would only give a richer appreciation to an already wonderful artistic expression. The mixture of story and song paints a portrait of the familiar experience of many who call this country home yet whose families roots are not native to this soil. Covering the full range of emotions from a beautiful love story in "Rosalie", to the nostalgic loss of "59 years," this is an album that takes you through a play like experience. This is also a great album if you are just a fan of Escovedo's music. His whole portfolio is represented here. "Inside This Dance" is a slow ballad that holds the honesty only Escovedo can portray. Pushing up the tempo like his work with his hard rock outfit Buick MacKane, is the back breaking honesty, with touches of humor, of "Hard Road" which tackles the frustration of being unable to overcome who you are or where your from no matter how hard you try. This is album about a generation we all can relate to, cause it is our parents and our grandparents and listening to it is like sitting down and taking in the stories of their live, gaining understanding of where you come from by the roads they have traveled.